Just because it’s Fall doesn’t mean I stop drinking smoothies. I have been making smoothies for breakfast since I was a teenager. They have evolved dramatically since the fruit and ice cream versions of my high school years. In the past decades, a high anti-oxidant frozen berry version has garnered the attention and awe of many guests at my place. I have been asked for the recipe more than once. I recently chipped the bottom of the glass jar to my blender. It leaks so I had to improvise or do without my morning smoothie delight. I got out my stick blender, AKA immersion blender, to do the job. I found that I could make the smoothie much thicker than with a regular blender because it didn’t need as much liquid. I could press down on the ingredients to blend them instead of relying on gravity in the blender. Using the blender, I often had to stop and loosen stuck pieces of frozen fruit wedged in the blender blades. I call these sorts of discoveries Happy Accidents. When I asked David Bishop, the photographer, to shoot my favorite smoothie for my book, he said he would like to shoot a smoothie series. I came up with another three tasty, healthy and eye catching recipes, using the same principle and technique as my Blueberry Cherry Acai Pom Smoothie, with the theme of color and garnish for variety. Most of the ingredients are found in any grocery store these days. If you can’t find some of the fruits in frozen form, you can freeze them yourself. 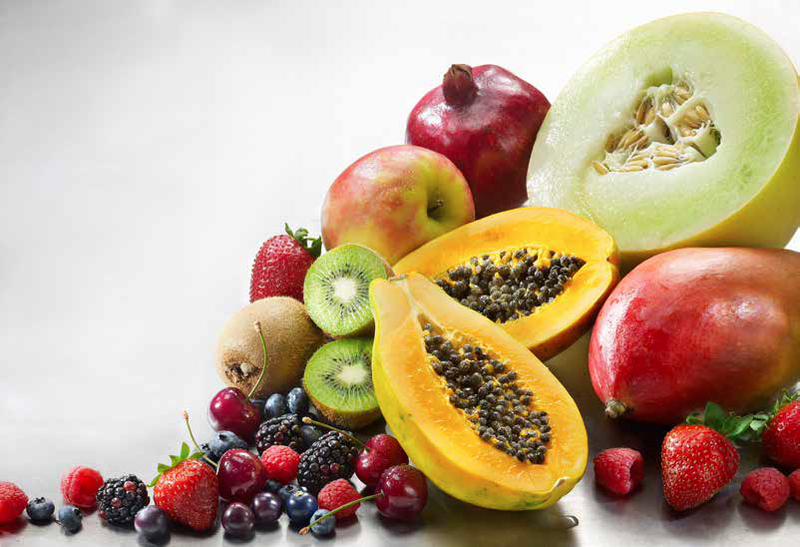 Cut ripe fruit into one-inch chunks and spreading them on a waxed paper lined tray in the freezer for about an hour. When they are sufficiently frozen, so that they won’t stick together, store them in sealed plastic container or plastic zipper bag until you use them. I find it helpful to label and date anything I put into my freezer. My fruit smoothies are not just the domaine of breakfast fare. With the protein elements, they can be a snack or any meal accompaniment. Experiment for yourself to find your favorites, your friends’ and the whole family’s. For the recipes for my smoothies you can follow below, or use your favorite ingredients. In any season, use whatever is available. As for the instructions, they are basically the same for any of my smoothies or your own renditions. When using a stick blender, place the ingredients in a tall narrow flat-bottomed quart container. Put the liquids and/or yogurt in first, then the powders. Add in the fruits and other ingredients, and blend with the immersion blender. For conventional blenders, follow the same suggestions, using the proper blender jar. Tip: You may want to add the frozen pieces in a bit gradually if they are really hard or give them some time to soften just a bit before adding and blending.